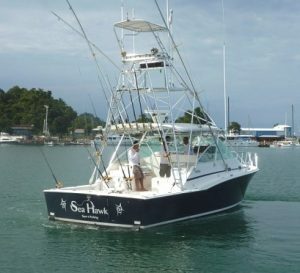 This 36ft Cabo Express powered by two Cat 3208, 450HP turbo diesel engines fishes out of Pez Vela Marina in Quepos. Captain Roberto Gonzales is at the helm, assisted by mates Gilberto and Xoxan. She comes equipped with full a/c cabin, full bathroom with shower, full kitchen, tuna tower, outriggers, fighting chair, GPS, digital fish finder, radar, and full stereo. In addition to a complete range of Penn International big-game and light tackle fishing equipment, she also carries a marine radio, VHF, SSB and a complete USCG-approved safety lifesaving package.